When voting in the 2018 Goodreads Choice Awards, I noticed that there were some categories where I had read multiple nominated books, and some where I hadn’t read any. Given that everyone has genre preferences, this made sense. But it also made me realize that I need to diversify my reading. I want to be able to vote in all of the categories, or at least most of them. So that is one of my goals in 2019. Welcome to my diversify your reading challenge! I hope you join me. What’s the ‘Diversify Your Reading’ Challenge? I have created this challenge to encourage myself to read books in genres I don’t typically read. For each month, I’ve chosen a genre that I think is one of the lesser read ones and I am going to read a book in that genre next month. If you want to join me, you can either read along in the same genres (I hope you do!) or choose your own genres. Not only will this help diversify your reading, but I also think it will teach you new things and open you up to new experiences. Of course, you can read books from your favorite genre in addition to books in the genre of the month. The idea is to diversify your reading by ensuring you read at least one book in genres you don’t typically read. Who knows – you might end 2019 with a new favorite genre! That’s it! 12 books in 12 genres over 12 months. Seriously, this is SUCH an easy challenge and will no doubt be a rewarding one. I have outlined the twelve selected genres below; however, feel free to swap one for another in order to diversify your reading as much as possible. 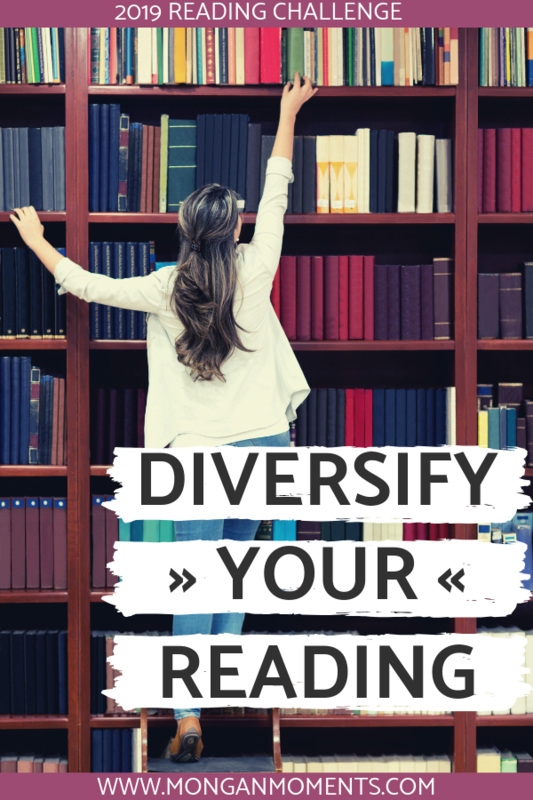 If you want to read the same book as me, join my Diversify Your Reading Facebook group for discussion opportunities! Also, feel free to join the group just to chat about the challenge or see what others are reading. 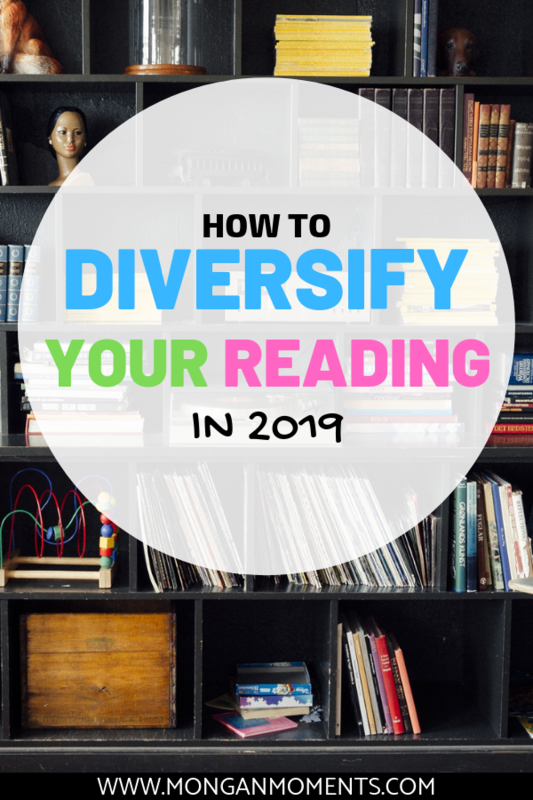 Which genres are included in the Diversify Your Reading Challenge? 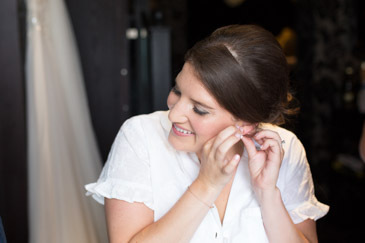 Since there are only twelve months in a year, I cut out 9 categories. 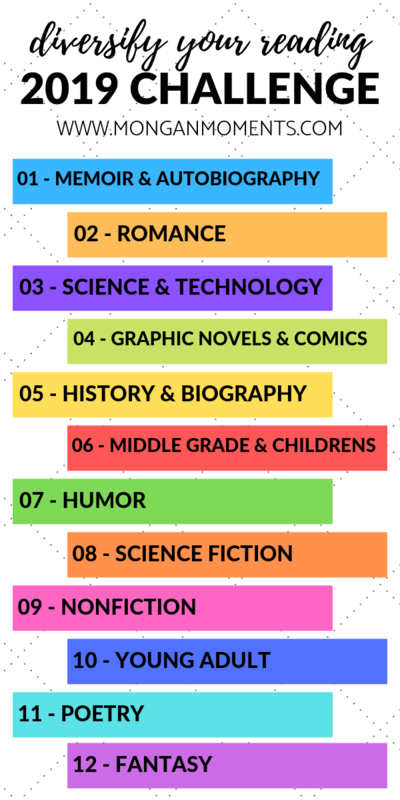 I first eliminated Fiction, Historical Fiction, and Mystery & Thriller as I feel that these are the most popular categories. Then, I cut out Best of the Best since it’s a roundup of previous winners, Picture Books since I don’t think you need a month to read one, and Horror because I personally cannot read Horror. Last to go were Debut Author (I’m sure one of the books you read will fall under this category anyway) and Food & Cookbooks (I recommend you buy one anyway). I was still one over, so I combined the Young Adult genres into one. With twelve categories remaining, I have chosen one for each month of 2019. For each category, I have selected six books from past Goodreads Choice winners and nominees (2015-present) as examples. As new releases are announced throughout 2019, I will also add those under each genre. Perhaps some of them will end up in the 2019 Goodreads Choice Awards! I don’t want to overwhelm you with options, but I do want to provide a variety of books so you can find something you want to read for each genre. New releases will be added as I hear about them! I’ve been so impressed with the evolution of middle grade & children’s books recently, and am so excited to actually sit down and read one. They explore such a wide range of topics and do so in an understandable way, so kids are reading about things that actually matter. In all honesty, I think everyone should read more children’s books! May is a great month to also read a picture book since the middle grade book shouldn’t take you too long! Pin the 2019 Diversify Your Reading Challenge Genres! I’ve been more into fantasy than ever after reading The Bear and the Nightingale and The Girl in the Tower by Katherine Arden. I absolutely love the series and am looking forward to reading the third book in the trilogy. Check out my reviews of the first two books: #1, #2. 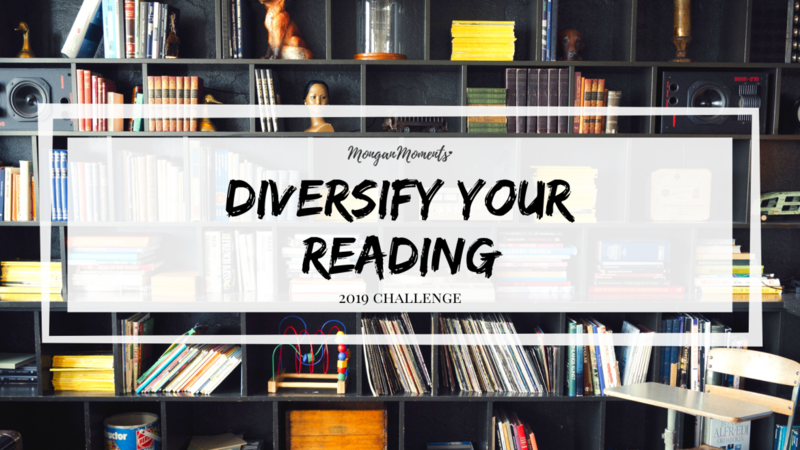 Will you be participating in the 2019 Diversify Your Reading Challenge? 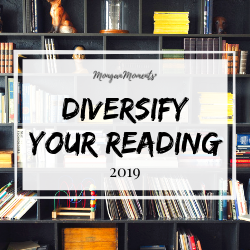 I can’t wait to diversify my reading in 2019 by choosing a different genre each month, and hope you join me on this challenge! Click here to see what other challenges I am doing in 2019. I’m in. This is a great idea for a challenge. Woohoo! Thanks for joining 🙂 Make sure you join the Facebook group if you want to see what we will be reading as a group, or check back here as I will be updating the post with the group reads each month! I’m in for the challenge! I like to read more of genres that are out of my comfort zone. Woo! So happy you’ll be joining, and can’t wait to see what you read! I am so excited to read some of these genres that I definitely wouldn’t be picking up otherwise! That’s the best part! Now that I’ve been looking for books in genres I don’t typically read, I’m actually REALLY excited to read them and more books in that genre! Such a great idea! I just found this post through Pinterest, but interestingly enough I’m already doing the challenge by reading “Becoming,” by Michelle Obama (which I HIGHLY recommend). Definitely going to give this challenge a try! I’m listening to Becoming at the moment, while also reading Educated. It’s always so interesting to get a behind the scenes look at the life of such a public figure! Count me in. I’ve already started the challenge but haven’t posted it. I’m new to blogging so I’m kinda late in signing up for challenges.